Today feels like Christmas Eve to me. In my family on Christmas Eve, we always got to open up one present. I’d spend hours that day picking out the perfect present to open, creating lots of anticipation for it. This evening, the women compete the first night of the Olympic Trials. We get to open up the first present, but still have to wait to open up the rest. But this first present, it will be awesome and worth the anticipation! What should you be looking for over the next two days of women’s gymnastics? First of all, sit back and enjoy. Even at the Olympics, you will not see such an amazing display of gymnastics. If you love watching gymnastics for the sake of the high flying skills, breath taking flips and soaring leaps, graceful dance and lovely lines, then today will be a feast for the eyes. Look for fierce competition. And deep friendships. These girls love and support each other like no other USA gymnastics group I have seen. They are truly best friends. But that doesn’t mean that each one of them won’t give it everything they have to make that team. Every single one of them will be putting it all out on the floor. Look for the spots that we need to fill in for the “Big Three”. Jordyn Wieber, Gabby Douglas and Aly Raisman are locks for the team apart from injury. So the next two spots go to the athletes that can best fill in their weaknesses or contribute a higher-scoring event than one of the “Big Three”. The most glaringly obvious spot is on bars. Raisman is weak on bars. Jordyn can compete on bars as a lead off spot, but we will definitely need another bars star to fill in the third team final spot. But look to see what other events we might need someone on. Both Gabby and Aly have been inconsistent this year on their amanars, sometimes not scoring that much higher than a DTY, the vault most of the rest of the teams will be doing. If we want to take advantage on vault, we need three HIGH scoring vaults. Gabby has also been inconsistent on beam and sometimes floor. We will most likely want to put someone else up on beam. However, if Gabby is inconsistent on floor over the next two days, we might need another floor score as well. Look for the highest scoring bars specialist. Kyla Ross, Anna Li, Rebecca Bross, Bridget Sloan, Nastia Liukin. This is the score we need most, so start filling in the puzzle with the piece that makes the most difference. Look for the highest value add after that. Up to this point, it has been McKayla Maroney. She adds .7-.8 over using Aly/Gabby’s vault. Look to see if anyone else can add more than that on one or two events combined. Sarah Finnegan on floor and beam. Alicia Sacramone on vault and beam. Another bars specialist. Put all that together and we will have a good idea of our Olympic Team. Look to see the honor that it is to all the girls competing. This is an incredibly tough year of gymnastics in the USA and each girl has accomplished so very much just to make it this far. They have so much to be proud of and we should be so proud of them as well! Revel in the fact that you are seeing some of the best gymnastics in the world! Look forward to a weekend full of incredible gymnastics, dreams being fulfilled and a team being named! There is one thing you can be sure of. This year, the US Olympic Trials are sure to be as exciting as the Olympics themselves in gymnastics. There is currently so much gymnastics talent in the USA, that the battle to get on the team is more difficult than the battle to win a team medal. What follows below is the basics for what is at stake at the trials, how the teams will be chosen, how the scoring system works and who the athletes are. If you are looking for a general what to look for in terms of athlete potential, check out my blog tomorrow: What to Look for at the 2012 Olympic Trials. Happy Watching! Live streaming will be available on NBCOlympics.com with a cable, satellite or telco TV subscription that includes MSNBC and CNBC. Lise streaming will NOT be available outside of the U.S.
*Television coverage of the women’s competitions on June 29 and July 1 will be tape delayed in the Pacific and Mountain time zones but available live nationwide online. 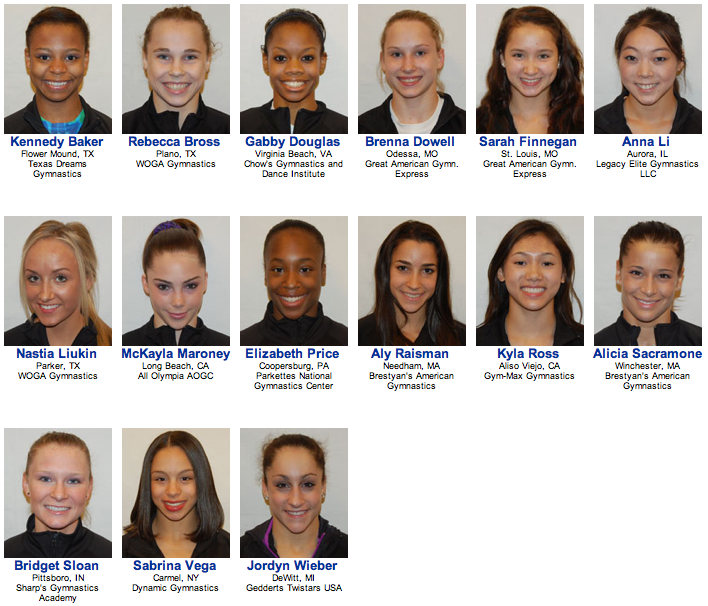 Starting tomorrow, 15 female and 15 male gymnasts will begin two days each of competition. At the end of the Women’s Finals on Sunday, five men and five women will be named to the 2012 US Olympic Teams. Up to three alternates will be named to each team as well. 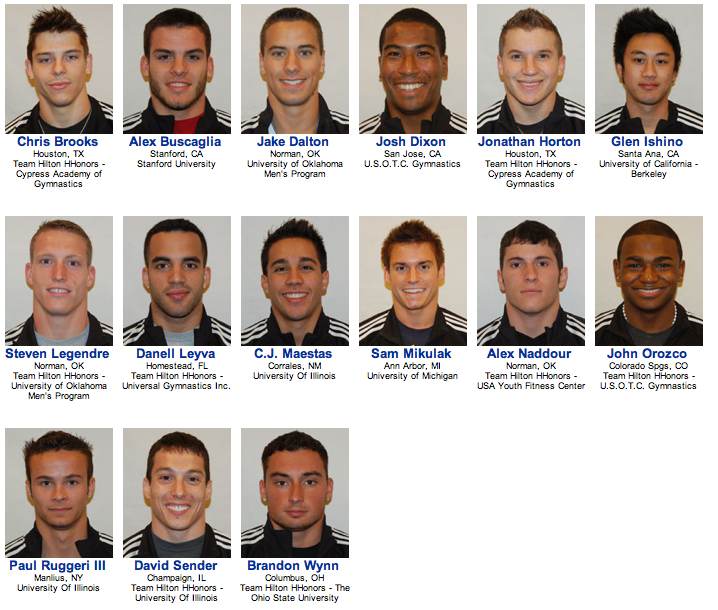 Ten gymnasts will achieve their ultimate dreams. Twenty will walk away, trying their best to hide their heartbreak and disappointment. The teams will be chosen based first and foremost on the best combination for winning Olympic team gold. In addition, Team USA wants to send gymnasts with potential for Olympic All Around wins and then Event Final champions. There has been a lot of speculation as to how the announcement will be made. USA gymnastics has said that the athletes will be told prior to being announced to the crowd at the HP Pavilion and on NBC. I’m still confused by the scoring system! Many people are. Here’s how it works. First you have the D Score– D is for difficulty. The judges add up the value of the elements done in the routine. This includes basic requirements, the value of the skills in their routine and bonus points for connecting skills together. The D scores tend to be between 5.5 and 6.5 (ish) at the Olympic level, higher on some of the men’s events. Of course you have some lower and some higher. Then there’s the E score– E is for execution. This is like the perfect 10 of old. You start at a 10 and are deducted for mistakes. These deductions are larger than they used to be, so this is why these scores are much lower than they used to be. A routine that looks near perfect to the average viewer will typically score around a 9.1. There is a pattern that these scores get higher in an Olympic year and some are speculating this will raise to about a 9.4. Needless to say, they are lower than you’re used to. Then you add the two together and get your final score. Another note on scoring. The last olympic cycle, gymnasts counted 10 elements in each routine (apart from vault) to make up their D score. Now they only count eight. This means that scores this Olympic quadrennium are LOWER than the last. This has confused many people, leading them to wonder if our gymnasts are worse this year than before the last Olympics. This is DEFINITELY not the case. We have the deepest American team ever assembled on the men’s and women’s side. And here are your guys. Good luck to all the gymnasts! In 2009 Rebecca Bross burst onto the senior gymnastics scene after missing her opportunity to go to the Olympics due to her birthdate. Bross is Boss was a common slogan back then. She was a fierce competitor who attacked every apparatus with incredible difficulty, amplitude and her steely glare. She lost the World All Around title to Bridget Sloan on her last flip on her last event with a surprising fall on floor. In 2010 Rebecca dominated where ever she went. She won the American Cup and then the Pacific Rim Championships. She went on to win the 2010 National Championships by 3.3 points. Not quite the margin of Jordyn Wieber in 2011, but you get the picture. She crushed the competition. Then came Worlds. You know how we have all talked about the incredible feat of Chellsie Memmel competing bars with a broken foot in 2008? Well, Rebecca had been battling pain in her foot/shin leading up to Worlds. Sometime during Worlds, it turned into a hairline fracture in her ankle. She competed four routines in prelims, four in team finals, four in all around finals and two in event finals, not to mention training with a broken foot. After qualifying into the all arounds in first, she fell on beam and seemed to have lost any chance at a medal. She went out on floor, the downfall of her previous World Title. She did the routine of her life and brought the highest scoring floor routine of the entire competition to pull herself back on to the podium with a bronze. It was legendary, especially later knowing she did all of that on a broken ankle. Rebecca had surgery on her ankle and was out of competition until 2011 Nationals. At this competition, Rebecca didn’t look like herself. The confidence and drive she had before seemed to be missing. She had three falls throughout the weekend and ended up dislocating her kneecap in a heart wrenching bad vault landing. This took her out for the rest of the season. Rebecca has spent this season fighting her way back, trying to prove that Bross is Still Boss. She continues to show fierce determination but just can’t quite master the events she goes after so aggressively. Her particular achilles heel is her beam dismount. Even up to last year’s Visa National Championships, it was almost unfathomable to imagine that Rebecca Bross would not make the 2012 Olympic Team. But that may just be the case. Rebecca will need to beat out all the other bars specialists and overcome her beam dismount to make the team. She has continued to improve her bars and shows her high flying releases and sharp, right on top pirouettes. She continues to do a world class difficulty beam routine. Two Patterson dismounts could be what’s between her and London. Continuing on with our Bars/Beam specialists, we have our bars star from 2008. For even the most casual gymnastics fan, Nastia Liukin needs no introduction. After all, she is the reigning Olympic All-Around Champion. Nastia has some of the most lovely balletic lines of any American gymnast in recent times. Her beautiful lines on all events combined with her incredible difficulty on beam and bars and her perfectionistic competitive spirit led to her all around gold in 2008. Liukin announced her official comeback bid for the 2012 Olympic team at the World Championships in 2011. From that time until the US Secret Classics in May, fans anxiously awaited any word of her progress. At that competition, she showed a very respectable beam routine and podium training on bars that brought hope of things to come. Then came Nationals. Nastia showed some great portions of bars routines during training, but had quite a lot of spotting and never put together a full routine. When she went to compete, she just didn’t have the endurance to do a full bars routine. With the ok of Marta Karolyi, she planned to not do a dismount on either day and brought in two very low scores. The first day of Nationals, she did an improved beam routine from Classics and tied for 3rd. However, on the second day, she put her hand down on the beam and was much further down the results list. Liukin is a fan favorite (with many) and brings prestige, artistry and experience to the US team. There is something to be said when you have the reigning All Around champion on the floor. Watching her even on beam and bars is like going to the ballet – effortless, exquisite and mesmerizing. It is hard to realize just how difficult the skills she is doing are. She has the potential to be an incredible assest to the US team. Liukin will have a lot to prove at the Olympic Trials. She will be trying to win the spot of a bars/beam specialist. Currently her top competition seems to be Kyla Ross who has averaged a 15.32 on bars with a high score of 15.5 and a 15.06 on beam with a high score of a 15.5. There is rumor of Martha wanting Nastia to show a 16.0 bars routine. But honestly, if she is able to beat Kyla’s average and high score (and the other bars/beam specialists), I think she has a good chance of going. After all, we know that with more time, Nastia can do more. For the others, they are probably at their peak for this year. Here’s hoping that no matter what happens, Nastia continues to bring us the beautiful combination of athleticism and grace she has always shown. Check out my other article on Nastia: Nastia Liukin’s Return – An Unfair Response? Nastia Liukin’s Return – An Unfair Response? Nastia Liukin’s return to elite level gymnastics has been met with great fanfare and great skepticism. From some of the media, she has been the focal point. Celebrated as a name that is familiar and known. From many others, it has been met with much cynicism and skepticism. Many fans felt that she put off her decision too long, and that thinking she could return so quickly was arrogant and disrespectful to the gymnasts who had put in the time and should now be the ones getting the attention. Others felt that she really was not serious about her return and was just doing it for the added publicity. In all honesty, I am a bit befuddled by the negative response she has gotten. Let me go back a bit (beware, I am stepping up on to my soap box). In 2008, Nastia tied (unofficially, officially she got second through a complicated tie -breaker system that has since been done away with) as the Olympic bars champion. Even with Nastia’s incredibly high scoring bar routine, China beat the US by 1.65 on bars. In 2010, the USA lost on bars to China by .3, even though China had a fall and the USA went clean. In 2011, the US went in to team finals having lost most of their strong bar workers. Rebecca Bross, Mackenzie Caquatto, and Anna Li were all injured at some point in the process getting to worlds. Bridget Sloan was injured earlier in the season. This took out everyone who had been up on bars in the previous season and led to them putting up Sabrina Vega, Gabby Douglas and Jordyn Wieber in the team finals. Jordyn Wieber, who most wish this year that she would not need to be one of the team finals bars scores, was our top bars score in 2011. Though we still won overall, even with only one of their strong bars workers, Russia beat us by .9 on bars. Though Gabby Douglas is our celebrated bars star right now, last year she either tied with Jordyn Wieber or was beat by her in all but Worlds qualifications. Gabby was scoring between 14.2-14.8. Did you notice those are 14s?!? Am I the only one that remembers how many times we said, “Nastia, come back! We desperately need your bars” over those years? I remember a poignant moment at the last year’s Visa Championships where NBC showed Marta and Nastia (who was on the selection committee) talking seriously. Tim Daggett joked that Marta was begging Nastia, “Please come back and do bars for us!” Sure Nastia has come back for her own personal goals and glory. Of course she has. But after achieving the ultimate gymnastics goal, what more does she have to prove? Nastia talks a lot about being afraid she would be sitting in the stands in London saying “What if.” But I wonder if she worries that the she would be sitting in the stands, wholly invested in Team USA’s results in her role on the USA selection committee, wondering “What if I would have helped out on bars and we would have won gold?” After all, in 2011 we knew that Russia had two stars sitting at home that could drastically change the outcome of our 2011 win. Now it’s 2012. Gabby Douglas has increased her bars score by almost a point. Kyla Ross has come onto the scene and increased her bars start value by .6 over the previous year. Rebecca Bross and Bridget Sloan are back. And though we still don’t have an incredible bars line up, it looks like we have some good possibilites. But we still don’t have anyone, including Gabby, that can likely challenge the Russians on bars. So after years of hoping that Nastia would come back and give us a world class bars routine, instead of hope and excitement over what she might bring, she has been met with a good deal of scorn and skepticism. Speaking of fame and money, how do we tend to remember gymnasts who end their career on a failed comeback? How do we remember those that end on their highest achievement? Take Carly Patterson. We remember her smiling face as Evgeny Marchenko hoisted her up as the AA Olympic Champion. But what about Shannon Miller, Dominique Moceanu, Tasha Schwiechert? Sure, with all the incredible gymnastics they performed and their moments of glory. But also with a slight twinge of sadness and regret at their unsuccessful comeback attempts. Without a doubt, the best way to go out is on top. If what Nastia really cares about is fame and glory, then she should NOT try to make a comeback. She should bask in the glory of this Olympic year as the reigning champion. Do tons of interviews as the athlete representative. Spend all her time traveling from media event to media event, gushing with advice and well wishes. She will never again be the reigning all around Olympic champion. THIS is the time to take advantage of the once every four years gymnastics fervor. Instead, Nastia has chosen to limit her media opportunities and to spend most of every day in the gym. Will she make it? I don’t know. I hope so. How I long to see her beautiful lines and graceful bars and beam at the Olympics. How I want her to redeem that ridiculous tie breaker and win the gold medal she deserves on bars. But not matter the outcome, I stand with incredible respect for the comeback attempt Nastia has made. And who knows, she just might do it. Nastia is an enormously talented gymnast. Though it may not be fair, talented gymnasts often just don’t need as much time to prepare. Valeri and Nastia Liukin have shown in the past that they understand how to prepare and how to peak. And that they absolutely do not like to be embarrassed by poor performances. I, for one, will not be surprised in the least if Nastia comes to Trials with a bar routine that proves she can be ready. Only time will tell. But even if she can’t pull it off, I tip my hat to Nastia and say THANK YOU for gracing us with your presence once again and for stepping in to try and help Team USA where we desperately need it. Check out my Who’s Who in 2012: The Lovely Liukin for my “normal” blog post on Nastia. And now it is time to take a look at our different bars specialists. First up, Anna Li. After an enormously successful NCAA career, Anna Li returned to elite gymnastics. She made the World Team in 2011, but after an abdominal injury became to painful, she was relegated to alternate. Her upbeat attitude and constant smiling support of the team as an alternate at the 2011 World Championships was as impressive as her incredible bars routines. At the 2012 Visa National Championships, Anna Li posted a difficulty of 6.7 and 6.9. This is by far the most difficult bar routine in the US. For comparison, Gabby Douglas posted a 6.5 and 6.6. She has recently blogged that she is working on her 7.1 routine. The only other gymnast posting that high of difficulty is China’s He Kexin (who may or may not be at the 2012 Olympics). Anna Li also competes beam. But her difficulty scores are way too low to be used in a team finals situation. If Anna Li can upgrade her bars difficulty to a 7.1 AND improve her E score to be in the 8.9 range, she will make an incredibly strong case for herself as a bars specialist. This, along with another gymnast who can bring a high vault score and beam score might get her on the team. Anna Li impresses me as a team leader, an incredibly sweet spirit and someone who can score the high bars scores we would need to keep a minimal gap with Russia on bars. She will need to bring her very best to Trials and compete two well-executed, high difficulty, hit routines. 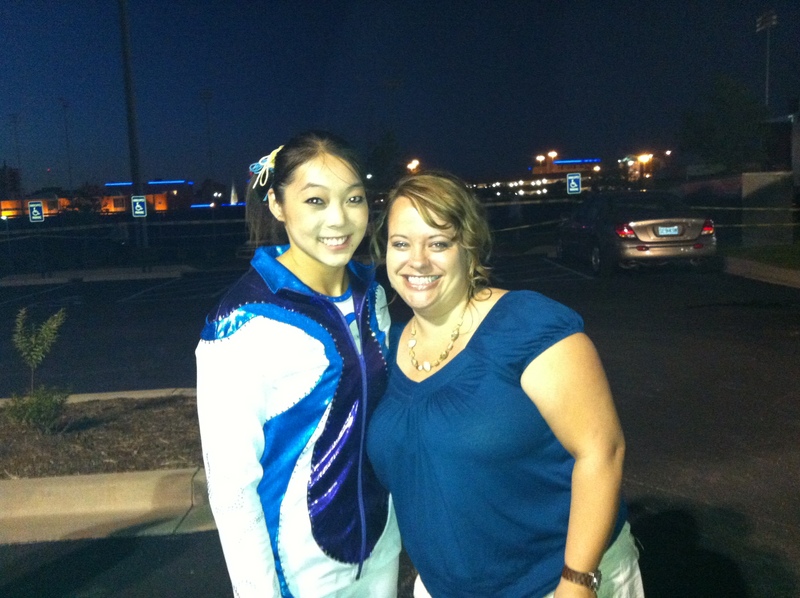 Anna Li has also choreographed on of my very favorite floor routines with her mother. It is still to be seen if she will ever compete this routine again after a rough start at the US Secret Classics, but even the dance through was worth it. It gave me chills! Through a fun twitter discussion, I realized that I have a formula for picking my Olympic team. It seems very obvious to me, but just in case Martha isn’t aware, I will spell it out. The Big Three: Jordyn Wieber, Gabby Douglas, Aly Raisman. Enough said. The Fifth Spot: If you choose Sloan, Li, or Ross, you need a beamer. This means Finnegan or ASac. If you choose Ross or Liukin then you just need the person who adds the most tenths to ANY area. Maroney on vault. Anna Li on bars. ASac on vault and beam. Finnegan on beam and floor. In that order. Also weighing in is Douglas’ consistency on floor and beam, and if we will need a score to replace hers. Or maybe a second bars specialist to replace Wieber. It will all come down to the math -averages and highs. Now that we are all blue in the face with proclaiming our teams, the Olympic Trials need to arrive already so we can sanely go back to our normal lives. But really, who wants to? American gymnasts are often accused of lacking artistry. But such is not the case of the sublime Sarah Finnegan. Finnegan commands the floor as if it was her stage. She is mesmerizing from her triple wolf turn, through her exquisite front tumbling to her dazzling finish. Finnegan has top difficulty on floor and beam. She can compete this difficulty with incredible form, beautiful artistry and attention to detail. Others have done the triple wolf turn on beam and floor, but no one makes it look like she does. Finnegan is a true joy to watch. Finnegan has had flashes of brilliance on both floor and beam this year. She has the highest start value of any senior on beam in the world! She has a .4 advantage over the next highest Americans. On floor, she has the second highest start value of all the other Americans and the third highest in the world. But right now she hasn’t been consistent enough on either floor or beam to put her up in team finals over other gymnasts. Her highest floor score is .1 lower than Gabby’s highest floor score, and her average score is just below Gabby’s. On beam she has basically the same average as Kayla but Kayla has put up a higher score. Right now she just doesn’t bring the advantage over other gymnasts competing with her for that 5th spot on the team. However, I think she COULD! She has perfect form and execution. If she goes out and really hits two beam routines and two floor routines without wobbles and bobbles and steps, she has the difficulty to bring in very high scores. In addition to that, she has the beautiful lines and artistry that international judges love. If Sarah could add .7-.8 to her combined floor/beam scores from Visa’s by sticking her landings and going wobble free on beam, she could really make a case for herself. Or if Gabrielle Douglas does not show consistency on floor at Trials, or our bars/beam specialist ends up being a bars specialist only (like Anna Li) someone like Sarah becomes much more valuable to the team score. She will have to bring her best! Which do you like better, Sarah’s floor or beam? What do you think about her chances of making the team? McKayla Maroney: the Vaulting Vixen. (No, not vixen as in a malicious woman. Vixen as in totally gorgeous and amazing human female). McKayla is undoubtedly the best vaulter in the world. Perfect form. Unmatched height. Catlike, dead center landings. It is magical watching her do that vault. If McKayla makes the US Olympic team, even the most cautious gambler would bet on her as the Olympic vault champion. No one else matches her for difficulty or execution. The crazy part is that making the team is much more difficult for her that winning an Olympic gold medal! Martha Karolyi has said that McKayla needs to bring an improved floor routine in addition to her world champion vault to make the team. She opens with an incredible 3 1/2 twist and has a beautifully choreographed, graceful routine. However, she has to get her landings under control. She scored a 14.6 at Visa’s with small shuffles on every pass and a huge bounding step on her infamous third pass. McKayla is a confident, dynamic and beautiful girl. She is fun to watch and shows so much potential. McKayla would bring artistry, grace and those beautiful lines that international judges like to see. Lets hope she can bring those qualities on another event besides vault to make the team! What is your favorite time McKayla has competed her amanar? What do you think about her chances of making the team? This isn’t strictly gymnastics. But I can’t help but write on it. Has anyone else noticed how absolutely gorgeous McKayla Maroney is? No matter what the situation, the girl takes absolutely breathtaking pictures. Instagram McKayla Maroney “after workout hair!! Best of all was McKayla on a stretcher. Only McKayla can look like she is riding on a royal sedan when she is on a stretcher. (See :44 below). aThere just aren’t many that could pull off that look! Here’s to our future model! What’s your favorite McKayla picture? I saved my favorite pic of McKayla of all for my “Real” Who’s Who Post on McKayla. Check it out!